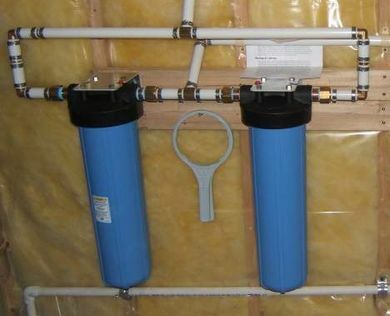 Frequently the most advantageous way to achieve high flow rates on a small budget is to use two or more small water filters installed in parallel so that only a part of the water is treated by each filter. For example, removal of chloramines from city water requires considerable “contact time.” This means that water must flow more slowly through the filter than would be necessary for removing chlorine. 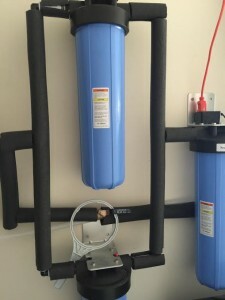 Contact time can be increased by increasing the size of the filter, but it is usually not practical to install massively sized and very high-priced tank-style filters in residences. 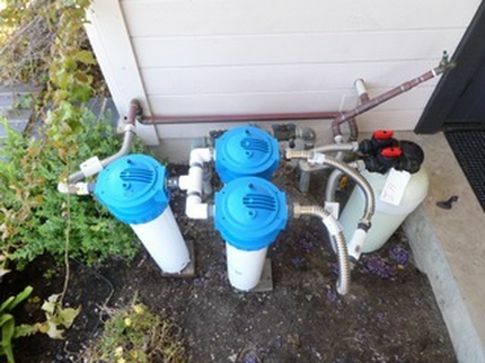 A single filter that will treat nine gallons per minute for chloramines is large and costly, but three filters each capable of treating three gallons per minute are much more affordable and much easier to install and maintain. Multiple small tightly constructed carbon block filters are also usually a better treatment for hard-to-remove chemicals like chloramines or pharmaceuticals than a large granular carbon unit. 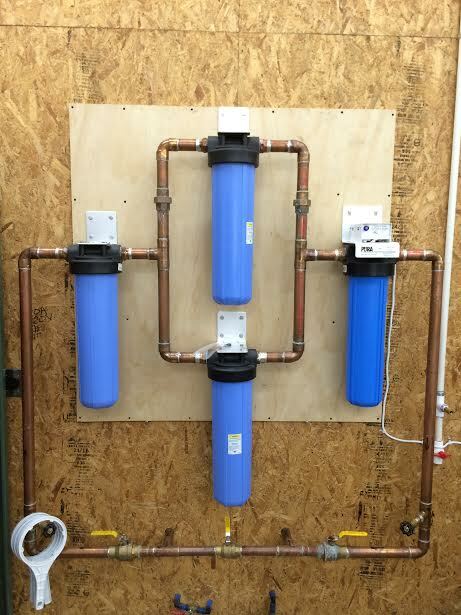 Below are installation pictures featuring such multi-filter installations. 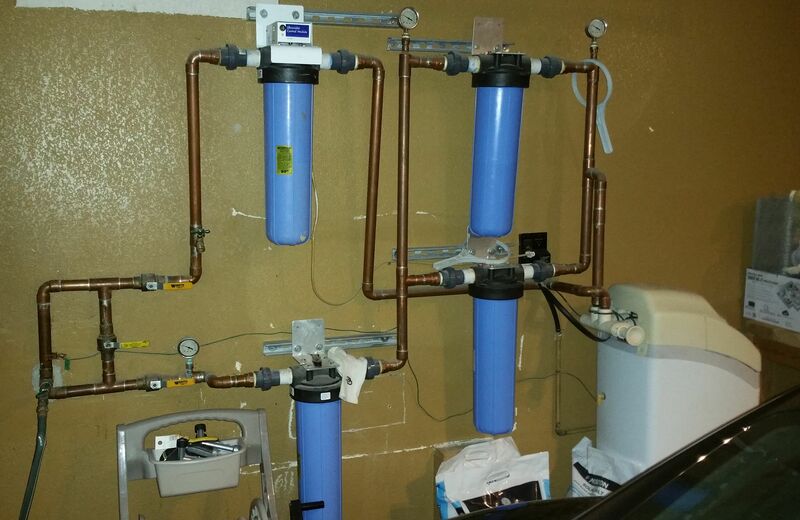 Above is a double carbon filter installed in a home in Missoula, Montana by Roger’s Plumbing Service. The whole house filter installation splits the flow of water so that each of the carbon block filters handles only half the water at a reduced flow rate. 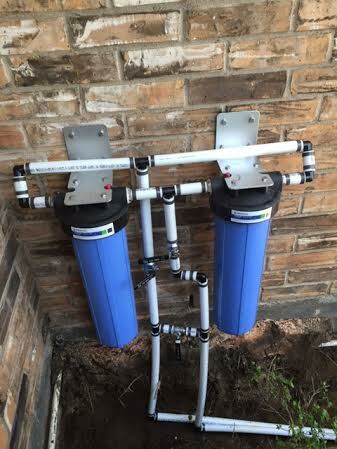 This McKinney, Texas installation shows the water flowing from the right through a sediment filter then splitting to pass through two carbon block filters. A softener, not shown in the picture, is located to the right. 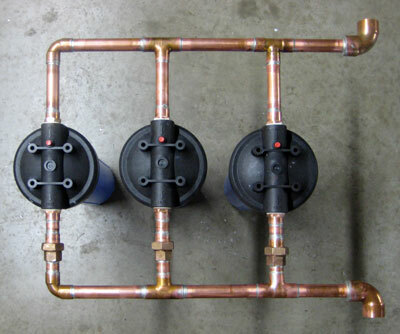 The Three-Filter Manifold was built by Denton, TX plumber Larry Sawyer for a New Jersey car wash. It divides the water stream into thirds to provide sediment filtration for a 60 gallon-per-minute water demand. 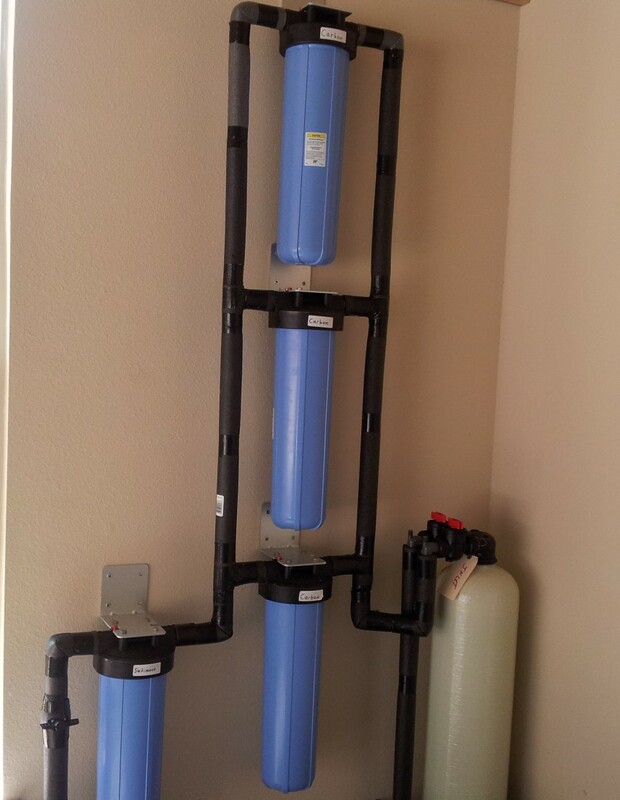 Above is a high-flow triple filter setup installed on a large home in Trophy Club, TX. The water enters from the left and goes through a single sediment filter, then the stream splits to pass through three catalytic carbon block filters for chloramine removal. The final stage, at right in the picture, is a Watts ScaleNet TAC anti-scale unit. Above is a split-stream setup near Valley View, TX installed by Ricky George Plumbing Service of Sanger, TX. Water enters from the left, goes through a single sediment filter, then splits to go through two carbon block filters. The final unit, at right, is a Pura Big Boy series ultraviolet system. The excellent installation features a plumber-built bypass (the three yellow-handled valves at bottom) plus drain taps on the vertical pipes to facilitate cartridge replacement. Above is an outdoor installation in a California home. It features easy-to-service Viqua housings which work well without brackets. Use of stainless flexible connectors allows some “wiggle room” for cartridge replacement. Flow is from left: sediment filter, two carbon block filters, and a ScaleNet no-salt scale prevention unit. This is a double carbon filter installation in Denton, TX by Sawyer Plumbing. Each filter treats half of the home’s service water flow. The installation features PEX plumbing and a plumber-built bypass. A protective cover will be added to prevent freezing.